When your bedroom is neat, tidy and clean, you sleep better, and there is data from the National Sleep Foundation (NSF) to prove it. The NSF conducted a survey of people including both good and poor sleepers, and it focused on the bedroom environment. 1,500 randomly selected adults aged 25 to 55 participated in the survey, and only 42% said they got a good night’s sleep every night or almost every night. 9/10 or 88% of study respondents report that they made their bed at minimum a few days a week. The study revealed that those who did make their bed were 19% more likely to get a better night’s sleep. Often ignored, the sleep environment is extremely important. The bedroom should be a sanctuary for sleep. Sleep specialists Colleen E. Carney, Ph.D, and Rachel Manber, Ph.D, and authors of “Goodnight Mind: Turn Off Your Noisy Thoughts & Get a Good Night’s Sleep,” suggest that one reason people spend their nights tossing and turning is becuase they’ve used their bed for other purposes like paying bills or watching television and have essentially trained their mind to be alert when they are in that space. Some of the things people do about an hour before bedtime to prepare are for a good night’s sleep are dimming the lights and staying away from the computer or other electronic devices like your phone or tablet. These devices emit a blue light that signals to your brain that it is daytime. It is also best to eat dinner early, at least three hours before your bedtime. Right before bed, a small protein-loaded or carb-loaded snack can aid in your sleep. Finally, a very important aspect of sleep is having a comfortable mattress. In the NSF survey, 92% percent declared that a comfortable mattress and pillows were very important. 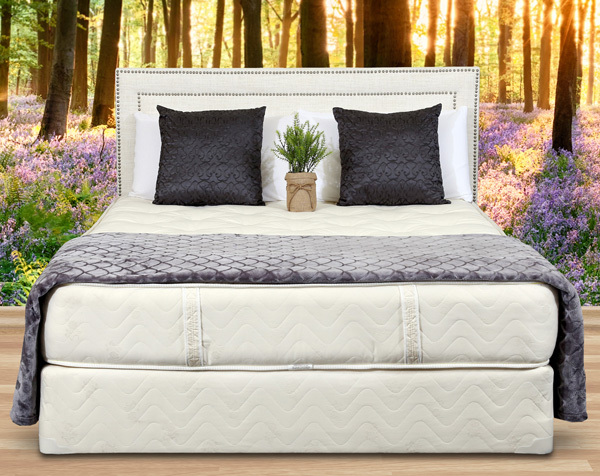 The Natural Sleep Collection by Gardner Mattress features natural organic cotton padding. It has not been chemically treated and is naturally resistant to dust mites, mildew, and bacteria. Chemicals in ordinary, mass-manufactured mattresses seep into the air you breathe, and those gases can cause health complications. These chemicals do nothing to prevent the mold, dust mites, bacteria, and mildew that can accumulate in your mattress. We spend a third of our lives sleeping. It’s worth incorporating these tips to create a sleep haven in your bedroom. Contact us today at 1-800-564-2736 to invest in your rest. Previous article	What Mattress Size Do You Need? Should You Start Using a Sleep App?